Is gender equality possible in an Islamic political system? Homa Hoodfar and Shadi Sadr argue that, at least in the case of Iran, the answer is yes. In “Islamic Politics and Women’s Quest for Gender Equality in Iran,” a September 2010 article in Third World Quarterly, the authors argue that the deficit of gender equality in Iran has more to do with the regime’s lack of democracy than with Islamic religious principles. 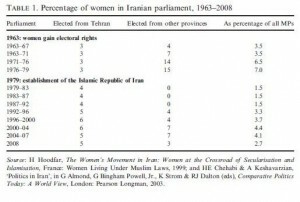 Hoodfar and Sadr trace variations in the political treatment of women over time in Iran. For instance, a more progressive Family Protection Law was passed during Pahlavi Iran and reversed after the Iranian Revolution. Elements of the law were reinstated over time, before more regressive family laws were passed in 2009. 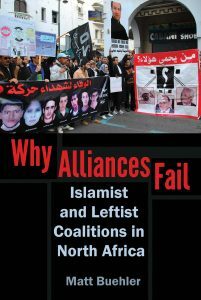 Hoodfar and Sadr argue that conservative elements of the Iranian government use the pretense of Islamic law to serve their political goals. Ayatollah Khomeini was strongly critical of Iranian women gaining the right to vote in 1963; however he encouraged women to take part in the protests of the Iranian Revolution. The authors argue that the Iranian regime has enforced stricter rules for women, such as a quota for women’s attendance at institutions of higher education, despite the lack of shari‘a guidance on these issues. 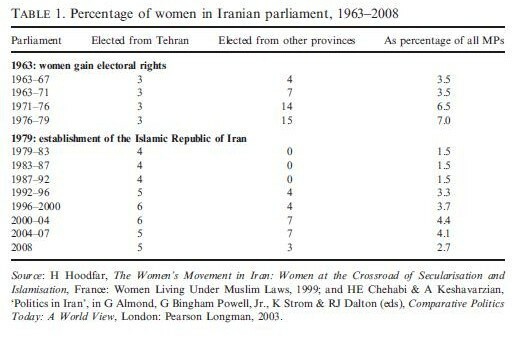 The authors argue that conservative government policies with regards to women, especially since President Ahmadinejad’s first election in 2005, have facilitated the mobilization of a pragmatic women’s movement. Islamist, reformist, and secular women have joined forces in this movement. Islamist women have also reacted to arguments by secularists that Islam is not compatible with gender quality and presented interpretations of Islamic texts that favor gender equality. The Zeinab Society, a women’s organization whose founders include those educated in Qom, argues that gender equality is compatible with Islam and successfully got inheritance laws changed in 2008 to give husbands and wives equal inheritance rights. Hoodfar and Sadr argue that women have forced gender onto the political agenda in Iran, asking presidential candidates questions about their positions on gender-related issues and sparking popular discussions as well. And yet religious conservatives have also tried to mobilize conservative women to support them. The authors conclude by arguing that more democracy in Iran, whether through a religious or secular regime, is necessary for gender equality in that country. Download “Islamic Politics and Women’s Quest for Gender Equality in Iran” from Third World Quarterly if your university has access here or email info@pomeps.org for assistance.